The dude is definitely building momentum. He’s simply a brilliant songwriter every song a hit with massive crossover potential. The kinda tunes that would appeal to anyone with killer hooks that anyone could sing in the shower car or office. Like I said dude is brilliant track is available Aug 15th get it in your life! Couple of weeks ago Hostess, poet, actress, comedian, singer and more Dione Reid launched her debut EP. The venue was nice packed with peeps out to see and support their girl and she gave em quite a show. Takes a little while to get going but once you get past the support acts and into her set it starts getting interesting. The lady without doubt has quality. There’s some real nice songs in there. She works with band well and she’s packing one quality vocal. Mad props to her and her team for pulling this all together (no mean feat). An entertainer in every sense of the word, and without a doubt a star in the making and a young lady you’d be foolish not to keep you’re eye on. I did last night @ Soul 4 Real…. HEAVY!!!! Quality look out for more to come! Big up Pinboardblog team for the visuals and being brilliant peoples! Not gonna lie any girl that can sing to me those words “come on honey, I’ll love you to the moon drops to the sea” like she does… Woooooiiii…. wifey right there!!! Seriously though she sounds absolutely gorgeous on that hook, a song that was made for a Love Actually/Notting Hill brit flick. A couple of weeks ago the ridiculously gifted Deanna Rodger launched a new weekly poetry event @ The Scream Bar in Bethnal Green. Poet, blogger and now promo maker Zanya Daze went down with her camera to film and give you a little taste of what to expect . With performances from Mr Gee, Raymond Antrobus and Deanna Rodger the standards are very high and there is much more in there too. So if spoken word is your thing get down to Bethnal Green every Tuesday Night for a free dose of genius. Again props to Zanya Daze for the promo! This is my pick of the A64’s to come through over the last couple weeks. Bluey is a next level vocalist dude brings something else to the table whenever he unleashes vocals and this is no different. He rips this cover to shreds! This brother is gonna be huge!!! All year long The Poejazzi team have spent 2010 hosting a range of amazing events all over London showing off the wealth of wonderful spoken word geniuses that can found all over the UK. Rammed out shows at The Roundhouse, Days of Decadence and The Royal Festival Hallto name a few have helped strengthen their that this is the “Year of The Poet”. Next week for the 2nd year in a row they will be taking over the E4 Udderbelly on the Southbank for the night and what a night it promises to be. 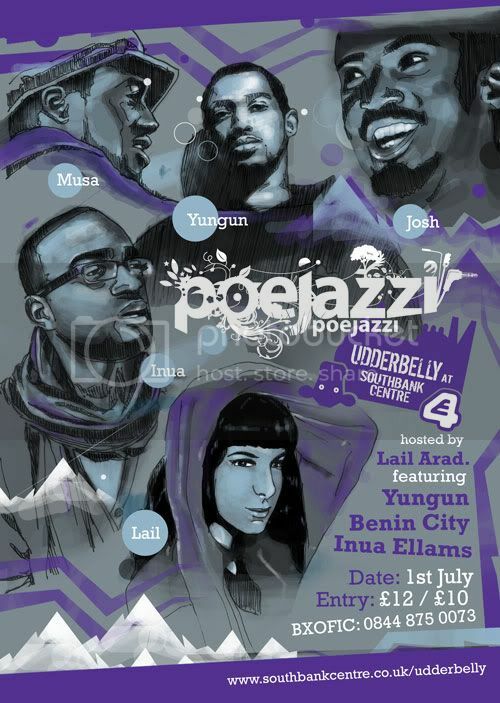 On the Bill will be internationally acclaimed wordsmith Yungun. He’s supported Slum Village and De La Soul over the years as well as Mark Ronson and Zane Low feeling what the lyricist has to say. Also the awesome Benin City will be rocking the stage with their Afrobeat Spokenword Funk masterpiece that the peoples at XFM and BBC 6 Music are loving! Fresh from finishing a 10 date sellout stint at the National Theatre with his one man show The Thirteenth Tale Inua Ellams will also be on the stage. Hosted by Exceptional new Singer Songwriter Lail Arad this promises to be a great night out on the Southbank. Clcik the link below for tickets before this one sell out! So you know we are all about UK here so its a little bit weird that we are featuring the scandanvian Songstress Rebekka but as the tune features our boy Joleon Davenue we had to show it some love. Its a nice summer song and Joleon rides the beat nice and actually pulls out some Jaffa Cakes!!! Big up to Joleon for doing something that very few out here are doing and reaching out to our peers in Europe. There’s a vast market out there filled with music lovers a little keener to spend money on music then on our own front doorstep. A little slice of the awesomeness that is Szjerdene…. Not really much you can say after that. Brilliant performance and she really makes the song her own. 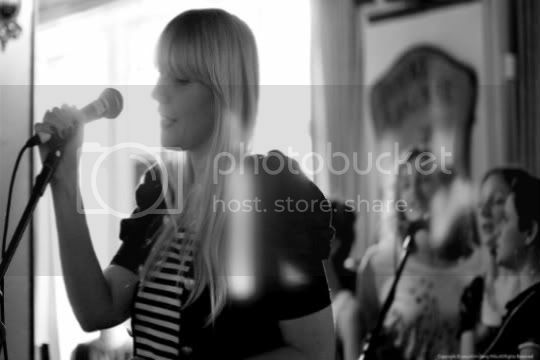 By the sounds of it she also silence’s a chatty crowd which says a lot about her vocal and performance style. Can’t wait for this lady to drop an album!